Contact Us | Quilt Connection Etc. | Serving Rapid City, SD since 1995! Quilt Connection, Etc. 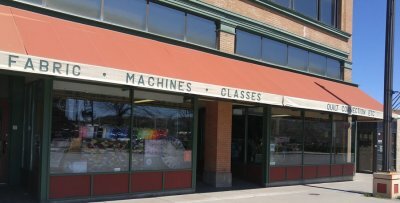 is located in historic downtown Rapid City at 522 St. Joseph Street just 25 minutes from Mt. Rushmore and the beautiful Black Hills. We carry the finest quilting cottons, including batiks, Stonehenge, brights, cozy flannels and novelty prints to name just a few, plus the latest books and patterns from top quilt designers. We offer quilting and sewing classes, taught by the area's most talented instructors. We specialize in Floriani threads and stabilizers. Quilt Connection, Etc. is a premier dealer of Husqvarna Viking and Pfaff sewing machines and sergers. Our service department is staffed by certified and knowledgeable service technicians and we service all brands of machines. You receive FREE machine classes with the purchase of any new Husqvarna Viking or Pfaff sewing machine or serger. Phone orders are accepted using Visa or MasterCard for payment.